I don't really believe anything when it says that it will keep my makeup on all day or for so many hours because my face doesn't like makeup on therefore likes to slip off after a few hours of wearing it. But I do like to try things that will help it to last that little bit longer, especially if I am going out for the day or even working as it does because a long day. 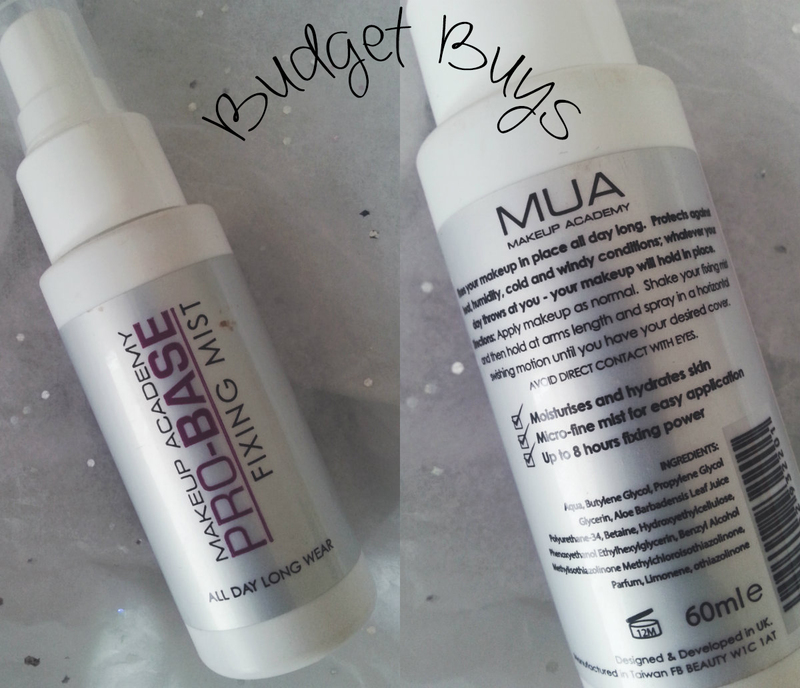 I recently bought this mist from MUA purely because it was only £5 and because I wanted to see what it was like on my face and how makeup fixing mists work because the whole concept baffles me entirely! After a few weeks of spraying this on my face a few times, I can say that I don't actually mind it. At first it feels really wet and sticky on the surface and when you look in the mirror it looks as though you just covered yourself in lots of glitter. But after a few minutes of waiting it dries and sinks into your skin. Saying all that I do have a tendency to lean on my jaw and rub my nose a lot so my makeup is going to fade away so this can't help me in that sense but it has allowed me from not powdering my face every afternoon. It is also only £5 so I guess it doesn't really matter if you hate it or love it because re-purchasing it is cheaper than the others on the market. The packaging is just normal plastic, but because its their 'pro' line the bottle is silver and packaged much better than their black one. If I use this on its own it doesn't work at all, I feel as though I need a primer as well to help my makeup stay on which is weird as this is meant to keep it stuck on but maybe its just my skin!